Construction on Central Park began in 1857. Within a decade some parts were finished enough to allow for embellishments. 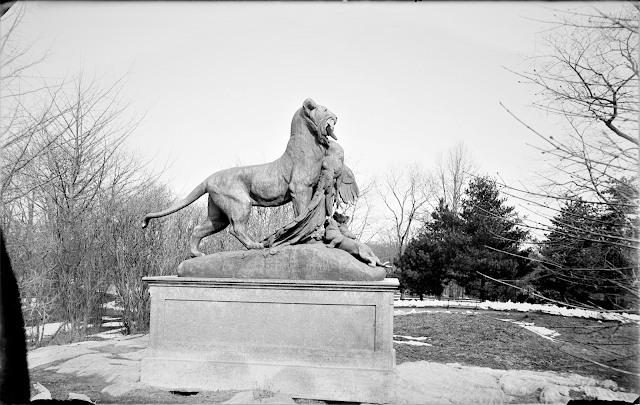 In 1864 Gordon Webster Burnham presented the park with a bronze sculpture, Eagles and Prey, by Christophe Fratin. 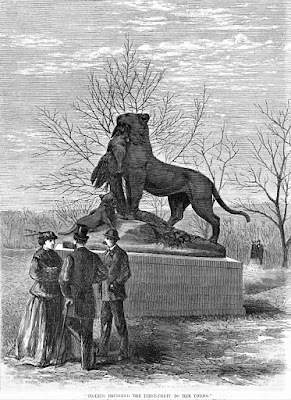 Three years later twelve eminent citizens including artist and inventor Samuel F B. Morse, jurist John Jay, Robert Hoe, and William T. Blodgett, donated another, Tigress and Cubs. The grouping was the work of 45-year-old French sculptor Auguste Nicolas Cain, He, like Fratin, was associated with the animaliers--a group of painters and sculptors who specialized in animal-themed works. 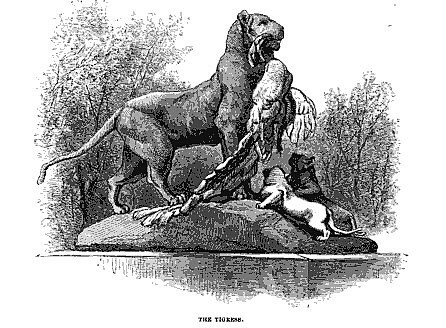 And like Fratin's, Cain's grouping depicted nature in deadly survival mode; a mother tiger bringing a newly-killed peacock to her cubs. The six-foot high grouping, cast in 1866, was placed on an outcropping of rock overlooking the lake the following year. In his speech at the unveiling Controller of the Park, Andrew H. Green, pronounced "The artist, by the freedom, vigor, and commanding expression with which he has treated his subject has placed himself among the first of the school of sculptures to which it belongs--a school especially adapted to the landscape of the Park." Cain had apparently not titled the sculpture and for decades journalists would apply their own names to the work. When Harper's Weekly reported on the new gift in April 1868, the article called it Tigress Bringing the First-Fruit to Her Young. And while the writer admitted that it "adds materially to the beauty of that picturesque spot," he seems to hold back on overall praise. "The citizens of New York will have ample opportunity of confirming Mr. Green's opinions of the beauty of this work." The problem was not the artist's adept execution of the subject--it was the subject itself. The issue which Harper's dexterously side-stepped was the violence depicted in the piece. Victorian sensibilities were ill-equipped to view bloody carnage, even when it involved motherly devotion. While Harper's Weekly had been diplomatic, other critics were blunt. Clarence Cook, in his 1869 A Description of the New York Central Park. wrote "We cannot agree with those who think such figures as this of the Tigress, and that of the Eagles bringing their prey to their young, particularly suitable to the Park. They are, both of them, fine and spirited works of their kind, but they are much better suited to a zoological garden than to a place like the Park, for the ideas they inspire do not belong to the tranquil, rural beauty of the Park scenery." 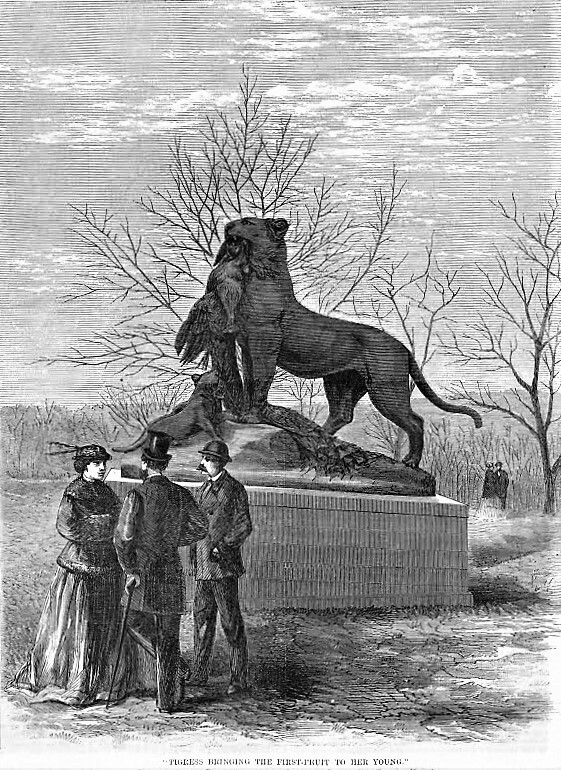 Cook's 1869 guidebook titled the sculpture simply The Tigress. A Description of the New York Central Park (copyright expired). Cook was unrelenting. "They are simply records of carnage and rapine, and however masterly the execution, or however profound the scientific observation they display, they are apart from the purpose of noble art, whose aim is to life the spirit of man to a higher region and feed him with grander thoughts." Four years later Scribner's Monthly chimed in. In a pages-long article about Central Park, it pointed out some of the regrettable statuary and suggested the works might be hidden away or moved. "No great harm is done by accepting from a private individual such a gift as the statue of Commerce...because it may be tucked away anywhere; and so with the 'Tigress and her Cubs,' and the 'Eagles bringing food to their Young,' which will find a good place somewhere about the new Natural History Museum, if the live animals do not object to the indifferent drawing of the bronze ones." Publications--and even the Parks Commissioners--continued to devise their own titles for the work. 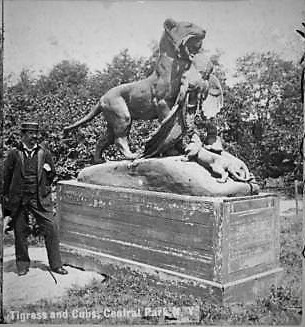 The May 12, 1883 minutes of a Commissioners' meeting called it the "Statue of Tigress and Young." In 1889 American Architect and Building News called it A Lion Bringing a Dead Peacock to its Cubs; and in 1894 the Evening World deemed it The Lioness and the Peacock, not even getting the species correct. After having sat atop a temporary wooden base for 16 years, the Commissioners agreed on May 12, 1883 that Calvert Vaux should design a pedestal from stone unearthed in the park's on-going construction. The minutes recorded "Resolved, That the Architect be directed to prepare a plan for a base for the statue of 'Tigress and Young,' now standing at the sound end of the Mall on the Central Park, and report whether a portion of the granite lying on the Central Park can be utilized for that purpose." There have been but two modern sculptors who have shown an equally pronounced genius for representing animals--namely, Barye, of course, and Barye's clever but not great Cain. The tigress in Central Park, perhaps the best bronze there (the competition is not exacting), and the best also of the several variations of the theme of which, at one time, the sculptor apparently could not tire, familiarizes the Americans with the talent of Cain." Maintenance of Central Park was never-ending. The City Record listed the expenditures of 1915 to fix arbors, railings, comfort stations and such. In reporting that $12 had been spent to repair Cain's grouping, the city gave it yet another name: Lion and Cubs. 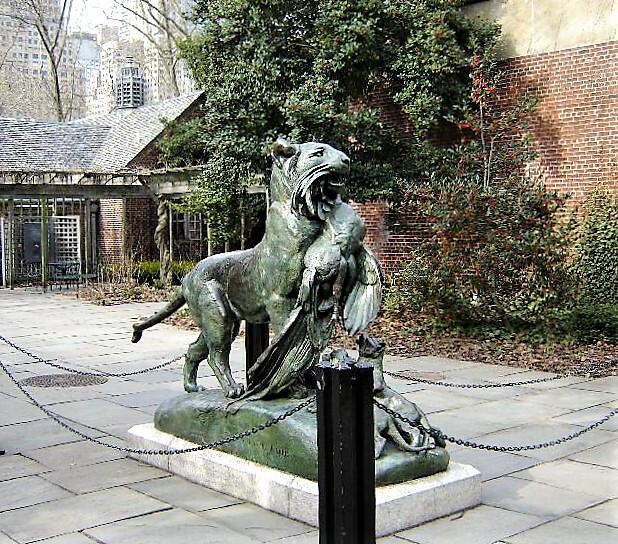 As Clarence Cook had hoped for 66 years earlier, Tigress and Cubs was moved to the Central Park Zoo in 1934. After a renovation of the zoo in 1988, it was again relocated, between the Tropical Zone and the Intelligence Garden. The removal of the stone base resulted in an extremely low vantage point and, subsequently, the loss of the former majesty of the grouping.